In modern biological research domain experts have to deal with complex and large data collections and simulations. Our goal is to support biological researches in molecular biology and phenotyping communities by developing visualizations that complement statistical methodology and wet lab with visual data analysis. Our tools allow the domain experts to see the key information they are looking for that relates to the studied structure, such as tunnels in molecules on the nanoscale or root shape distributions on the macroscopic magnification levels. Equally important is the role of visualization in explaining certain phenomenon to a larger audience. Biologists create large structural models that reflect the state-of-the-art knowledge about a certain living organism. This form of captured knowledge can be effectively communicated with interactive visualization, especially the aspect of understanding interplay of multiple spatial and temporal scales. 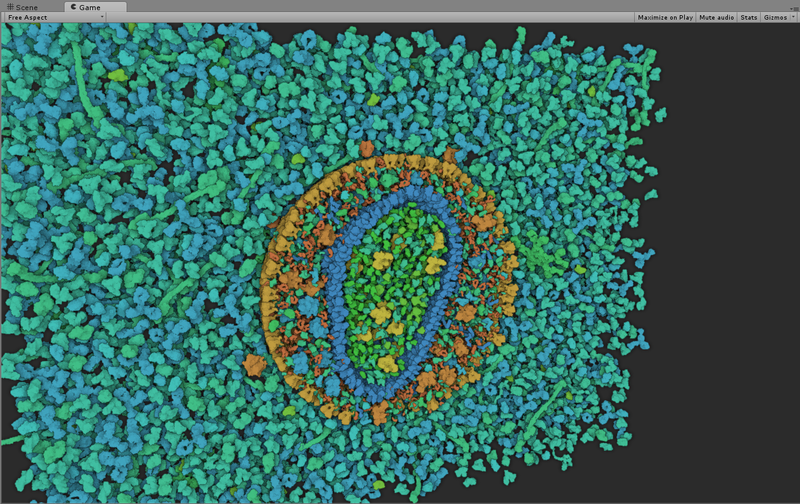 With our visualization technology audience can therefore seamlessly zoom from zoom level when seeing entire bacteria down to its atomic detail. In Proceedings of IEEE BioVis 2014, pages 1-22. July 2014. In SCCG 2013 - 29th Proceedings Spring conference on Computer Graphics, pages 120-127. May 2013. Following the paradigm of spatial augmented reality, we present an approach to dynamically visualize molecular properties directly on the surface of 3D-printed tangible models, using a digital projector.